Prefers moderately moist soil. Water thoroughly when just the soil surface is dry to the touch. Do not allow plant to sit in water. Red, orange, pink, peach and white, some striped with contrasting veins. Indirect or bright-diffused light. 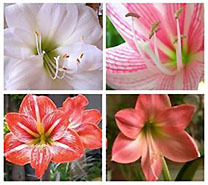 Amaryllis do well indoors. Bright light promotes best growth. Plant in loose fibrous potting mix. The stem may need staking to support the flowers. Cool/Moderate - Prefers 60�-70� days and 55�-65� nights. Plant comes in plastic pot from grower.